Create MSIX installation packages from the same source code that creates your MSI packages today! application as an MSIX package. Download Now Try our fully unrestricted 30 day no obligation trial, no credit card required! The progress bar and status text now reflect the actual build process notifications. Fixed an issue when a defined shortcut had an association to a file not part of the files to install. In such circumstances, this was causing an error with the shortcut(s) displayed by Entrypoint selection dialog. The application now returns an error if a shortcut points to an invalid file association. Updated the MSIX virtual registry layout. This now handles Win32 redirection (HKLM registry key) when necessary. Various Updates to the APPX virtual registry layout. 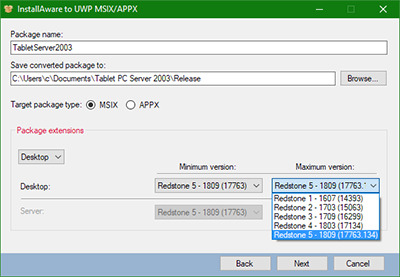 Both MSIX/APPX packages now include a richer set of image assets. Fixed an error with the header of the MSIX Manifest. Fixed the icons issue in the shortcut selection window. Updated the progress text displayed during conversion. New Virtual Registry layout support. The generated MSIX now includes "allowElevation" with AppManifest capability. 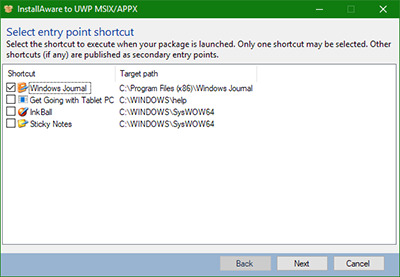 Package Parameters dialog: added "Target Package Type" radio buttons (APPX/MSIX).